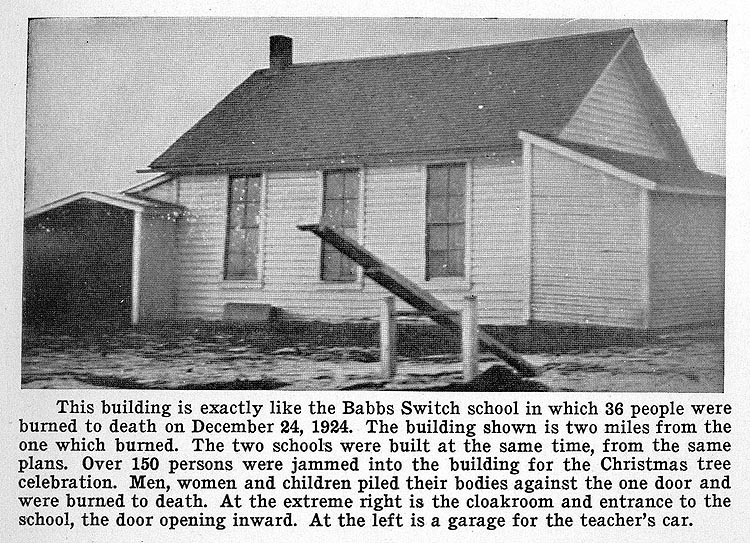 On Christmas Eve, 1924, thirty-six people lost their lives when flames swept the rural school at Babbs Switch, near Hobart, Oklahoma. Eighteen of the victims were children. The building was a small one-story frame structure housing a single schoolroom. It had two doors, both of which opened in. One of these was entirely blocked by a built-in coal bin. The windows were heavily barred to prevent tramps getting into the building when it was unoccupied. At the time of the fire some 150 people were crowded into the one room attending a Christmas entertainment. A Christmas tree was provided, decorated with tinsel and lighted with small wax candles. The tree was insecurely fastened to the floor, and toppled over once while being trimmed. It was again righted and fastened in the same manner. About nine-thirty o’clock Santa Claus, in reaching for a present near the top of the tree, pulled down a branch which came in contact with a lighted candle. The branch, decorated with cotton and tinsel, was immediately ignited. At this point some persons in the audience jokingly cautioned Santa Claus to look out or he would get burned. Santa Claus then picked up a small toy chair, threw it at the burning branch and in so doing knocked over a glass bowl kerosene lamp sitting on the table near the tree, which immediately exploded. The crowd stampeded for the door. Santa Claus, in the meantime, endeavored to smother the flame with a coat, and not being successful grasped a cotton curtain which had been used as a stage curtain. In his excitement he knocked the tree over, his clothing caught fire and in an instant he was a mass of flames. When the blaze reached the ceiling, which had been recently well painted with white oil paint, the fire flashed over the entire surface. Some of those who had escaped through the narrow doorway endeavored to re-enter the building with the intention of rescuing relatives or friends, causing a complete blocking of the only exit. Outsiders endeavored to tear the window screens from their fastenings but could not do so. However, the comer of one of the screens was loosened and one small boy was rescued through this opening. About twelve minutes after the fire started the building collapsed. As is usual in such cases, the wildest excitement prevailed and no doubt many were trampled to death before being burned. The teacher had at some previous time instructed her pupils, that in case of fire they should try to get out of the building by crawling along the floor toward the door. If any of the children tried to follow this advice, they were certainly killed. Nearly every condition favorable to fire and loss of life was present. The building was a frame tinderbox; lighted candles were placed on a very flammable and insecurely mounted tree; kerosene glass bowl lights on tables were the only illumination; the building was crowded beyond its capacity; one doorway was blocked up by a coal bin, the other opened inward and was difficult to open, and windows were effectively barred; there was not even a fire pail, and the fire was undoubtedly spread when attacked in its incipiency by wraps and bare hands. Those who escaped from the building had to stand by and see the fire burn unhindered, there being no semblance of a water supply or fire apparatus in the vicinity. 1. "Rural School, Babbs Switch, Okla., Dec. 24, 1924", 1000 School Fires, A record of 1000 school fires and major school disasters, October, 1939, Boston, Mass., page 13-15.